Many of us have spent hours online browsing Etsy stores, Pinterest, and other crafting sites either shopping for personalized gifts or wishing we could make such creative things. Well, with no more! If you are new to crafting you'll be shocked at how many amazing things you can make if you own your own Janome sewing machine. Think about how much money you have spent on gifts, clothing, and home decor in the past year. Chances are the amount is higher than you realized. Making your own things has tons of benefits besides saving money (although that is a pretty big perk). First, your gifts might get more exciting. Do you know someone obsessed with rainbows and cats? You can make a lovely blanket, a colorful skirt or even a rainbow kitten stuffed animal. Wanting to give your living room a makeover without spending a ton of money? Find some inexpensive material at your local thrift store and whip yourself up some new curtains. When you own a Janome sewing machine, the possibilities are endless. Janome has been making sewing machines since 1921. They have perfected the art of sewing machines. They back up all of their products with a 25-year warranty that covers defects in materials and artistry. 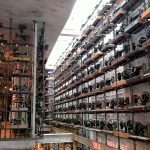 All of the electrical and electronic parts of their sewing machines are covered for two years from the original date of purchase. With warranties like that, you can be secure in knowing that you are making a good investment. Janome has a sewing machine for every budget. Ranging from around $60 to $1,400 you're guaranteed to find something that fits all your needs and can allow you not to overspend. Like with most things in life, the more money you spend, the more you'll get. The least expensive Janome sewing machine is small, portable and has 11 stitches. It is perfect for anyone who is a part-time crafter, likes to craft on the go, or makes things from lightweight materials. It comes in 11 fun colors and could also be an excellent option for someone who is just starting out sewing and afraid to make a massive investment in something they might not enjoy doing. 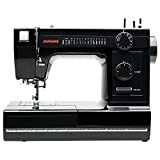 The most expensive Janome sewing machine is really made for someone who sews a lot as a hobby or has their own business. It is a computerized sewing machine with a ton of add-ons. The machine comes with as a bundle set which means it includes a rolling trolley, ten extra bobbins and an extra large arm for things like blankets, quilts, and dresses. It has a sewing speed of over 1,000 stitches per minute as well! Since Janome has been producing sewing machines for almost a 100 years, they know what they are doing and have a large selection to choose from when you want to buy a machine. We put together a list of what we feel are the top 10 choices of 2018. You'll find sewing machines for every budget and skill level. Here are our top 10 picks (in no particular order) that you should consider for our new Janome sewing machine. The Janome 2212 is a great beginner level model. This sewing machine has 12 built-in stitches, a simple four-step buttonhole maker, and easy snap-on presser feet. You can also adjust the width and length of any of your stitches. The drop feed option is great for free motion quilting and sewing. It even has a built-in thread cutter which makes going from one project to the next fast and easy. 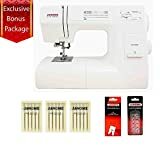 This sewing machine has 4.5 out of 5 stars on Amazon. 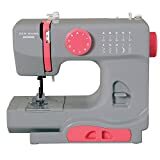 People who purchased this machine love the price and how uncomplicated it is to use, there are some complaints about the thread getting stuck in the bobbin case. The first thing you'll notice about this machine is the great colors it comes in. You can choose from couture, which is a beautiful blue, sorbet which is a delightful pink, and crystal which is a happy shade of teal. Don't let the fun colors fool you into thinking that this isn't a serious machine. The built-in bobbin loading guide means setting the machine up is easy even for beginners. It has 15 built-in stitches and a four-step buttonhole maker. The interior is made of metal, which makes it much more durable than other machines in this price range that are made of plastic. This model is perfect for sewing clothing, quilting, and home decor. It is rated 4.6 out of 5 stars on Amazon. People love the durability of this machine, although some people had problems with winding the bobbin. The high-tech Janome JW8100 is a computerized sewing machine is great for any sewing project you can think of. It has a built-in needle threader, auto-declutch bobbin winder, and presser foot lift. The LCD screen makes it very easy to select one of the 100 built-in stitches. The start/stop and reverse buttons located close to the needle mean that you can control the machine with ease and without the use of a foot pedal. The locking stitch button is a fantastic addition. It ties off the end of the thread which means there is no need to backstitch to lock a seam. This machine also comes with bonus accessories including an extra wide table, hardcover, and a quarter inch foot which is perfect for quilting. It has 4.4 out of 5 stars on Amazon. People love this machine and its ability to create many types of projects; there are some complaints that it doesn't work well on a thick material. This affordable Janome model is a portable sewing machine is perfect for children or adults. It comes in eleven different colors including red, purple yellow, and green. This model also only weighs five pounds with makes it perfect for someone who travels a lot or is taking sewing classes. The 11 built-in stitches are great for hemming, quilting, and even paper crafting. The presser foot also has finger guard protection which means you don't have to worry about children learning to sew on this machine. It has a top drop-in bobbin with a transparent cover so setting the sewing machine up can be done with ease. This machine has 3.2 out of 5 stars on Amazon. 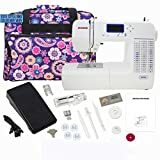 This machine received terrific reviews from people who purchased it for children and adults who use it for light sewing projects. Most of the negative reviews are from people who expected this to be a normal heavy duty sewing machine. The Janome HD3000 is a heavy duty sewing machine and is perfect for beginners or experts. It has an instructional guide on the top of the machine which helps you figure out which feet and stitches are best for a multitude of sewing projects. It has 18 built-in stitches and a one-step buttonhole maker to help you make any kind of project you can imagine. This sewing machine comes with a ton of free extras. It has a hard case, two packs of leather needles, a box of bobbins, five extra feet (including one for zippers) and even a small screwdriver. It has 4.1 out of 5 stars on Amazon. Customers love this machine for quilting, although there were some complaints about the machine keeping the correct tension. This model is designed for all types of projects including home decor, quilting, clothing, and crafting. There are 120 built-in stitches. It includes seven different buttonholes which mean you'll be able to use virtually any type of button on your projects. It has an LCD screen, on-screen stitch editing, and an automatic thread cutter. There are decorative stitches that have the option for adjustments as well. The tension dial allows you to set your tension, and as any seamstress knows tension is fundamental for any sewing project. This sewing machine comes with a hardcover, extension table, instructional DVD and several sewing feet for different types of projects. This machine has 4.3 out of 5 stars on Amazon. People love the type of features that are on this machine for the price. There was one complaint about a customer having problems with feed dog not working. 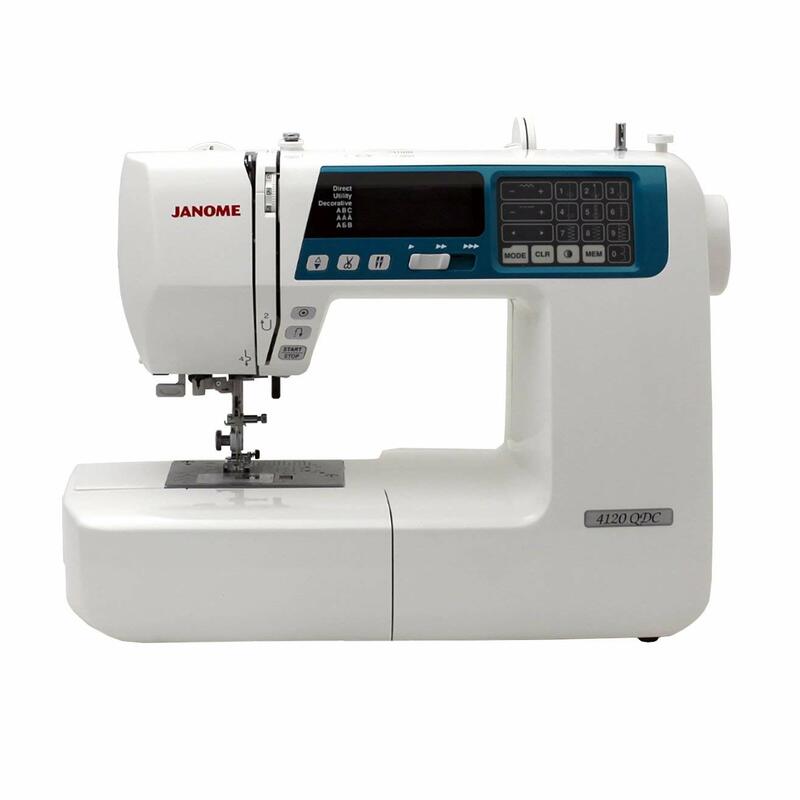 The Janome HD1000 model is industrial grade with an old school look. While you won't find an LCD screen on this machine, it has many other great features. The aluminum interior and outer body guarantee this machine will last. It has 14 stitches and one four-step buttonhole. The powerful one amp motor means that you can work on heavy-duty materials such as canvas, sued, and leather. 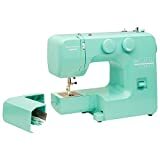 It has an adjustment dial with sets the length of stitches in an instant so you won't have any difficulty going from a fine fabric like silk to a more substantial fabric like leather. This model also has a drop feed for free motion sewing which is excellent for quilts. It has 3.1 out of 5 stars on Amazon. Customers rave about the durability and versatility of this model. There are some complaints about the refurbished machines not working well. This Janome MOD-19 sewing machine is great for anyone who loves to quilt. The 19 built-in stitches are perfect for detailed jobs. It has a built-in needle threader and horizontal bobbin system which mean that set-up is fast and easy. The jam proof bobbin system means you can sew at your speed, no matter how fast or slow that might be. It has a five-piece feed dog system which means that you can sew even the smoothest of fabrics with ease. The removable free arm gives you the perfect space for sewing everything from pants to pillows. This model has 4.2 out of 5 stars on Amazon. People who purchased this machine love how easy it is to set-up and use, although some people did have problems figuring out how to change the feet. The Janome 8050 has 50 built-in stitches including buttonhole making for three different sizes of buttons. The drop feed allows for easy adding on of buttons, darning clothing or motion free sewing for quilts. It comes with an additional arm for sleeves, pants, and cuffs. The LCD screen makes it easy to select the perfect stitch for each project. It also has a high-speed motor that allows you to sew everything from quilting cotton to denim. This bonus bundle comes with a lovely colorful quilted machine tote bag. It has 3.6 out of 5 stars on Amazon. People raved about the quality of this machine, although one person did have a hard time getting theirs to work. 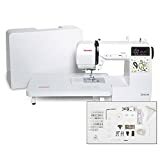 This Janome sewing machine is made for the dedicated seamstress, although it is easy enough to use even for a beginner. The computerized system allows you to customize everything from the stitches you're using to the speed of the machine. Speaking of speed, this model can sew up to 1,000 stitches per minute so you can zoom through projects with ease. It has a 9" x 5" throat space for large quilts and five different blanket stitches. One of those stitches is a unique hand look quilt stitch, which is perfect for giving projects an old-time look. This model also comes with some great extra items including a rolling trolley, so transporting your machine will never be a problem. This model has 5 out of 5 stars on Amazon. Customers love the versatility of this machine. There are some mentions of the machine being a bit too heavy. 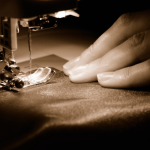 Which Janome Sewing Machine Is The Best Choice? Janome offers such a wide array of sewing machines that the answer to this question depends on your personal needs and goals. 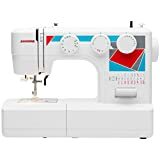 If you are new to sewing and plan on attending sewing classes outside of your home, then you'll probably want to go with one of the lighter less expensive machines. 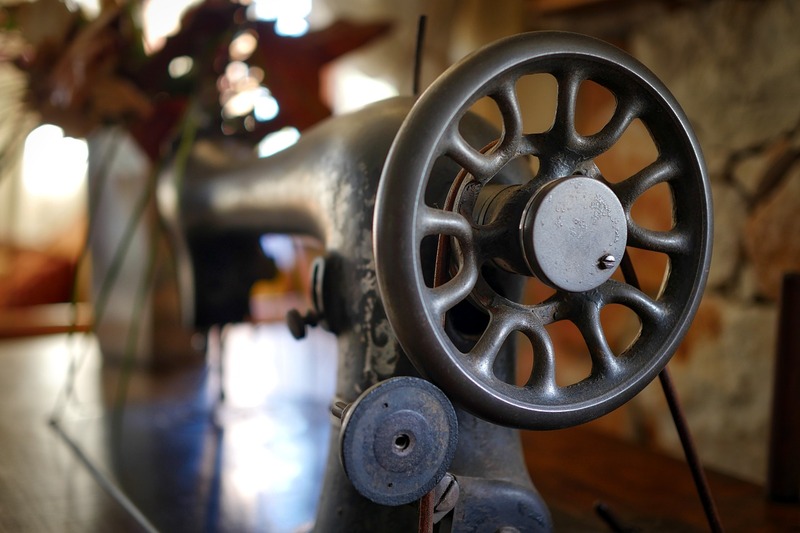 Although, if you are an experienced seamstress and enjoy taking on projects for friends, family, and customers then investing in one of the more expensive heavy-duty machines could be a great idea. 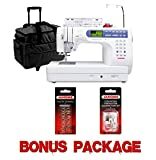 The variety of Janome sewing machines means that you can stop spending your time looking at other people's creations online and start making your own.